SPECIFICATION: Elegant Cubic Zirconia & High Quality Stainless steel; Chain Size: 43cm(16.93 Inch) inside circumference length. Pendant Size: 5.3cm(5 Inch) height. Earring Size: 3.8cm(1.5 Inch) L by 1.8cm(0.71 Inch) W. Total weight: 45g(1.5once). We committed to provide you the highest standard materials and craftsmanship. 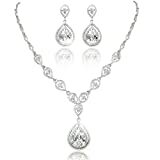 EASY MATCH: Unique stylish and classic elegant, this beautiful sparkling AAA quality cubic zirconia Jewellery set is for women and girls of any age. Fashion and exquisite, it will sure adds to your bridal dress a touch of fashion elegance, you’ll always stand out with this around your neck. Bright and shiny, yet understated, this set will work well with many different outfits, especially for party, wedding, anniversary etc. HIGH QUALITY&HYPOALLERGENIC: Lead and nickel free, this stunning necklace earring set is manufactured with healthy stainless steel, Cubic Zirconia and crystal. With perfect polishing and cutting technology, our Cubic Ziorconia and crystals shine as ZILLION DOLLAR DIAMOND, provide you a peculiar visual feast. PERFECT GIFT: Come with A BEAUTIFUL GIFT BOX, our necklace is an eye-catching gift for your mother, lover, wife, fiancee, girlfriend, bestie on Mother’s Day, Valentine’s Day, Christmas, Anniversary, Birthday. You can wear it on prom, party, date, casual weekend, picnic. Our exquisite necklace will definitely leave you a deep impression. SAFER GUARANTEE: We offer hassel-free 90-day money back guarantee along with top notch customer service to ensure happy purchase, and we are always willing to help if you have any problem. We’re doubling the length of Amazon’s Guarantee!